I used to have the book "the gospel according to peanuts", but don't know where I have put it. Will need to look for it sometime. 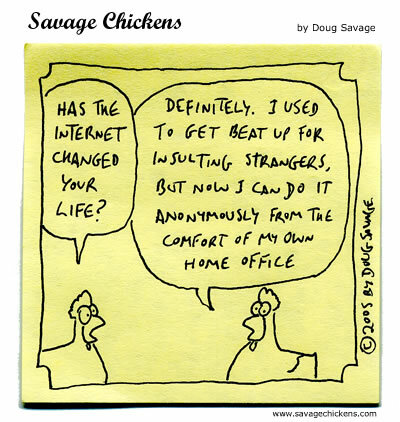 Has the Internet changed your life? March 14 East London - you could probably contact John Benn at First City Baptist Church for more details. "In spite of the usual appalling lack of advertising and local websites about the upcoming Delirious tour of SA, it's official! Dec 04 05 Pretoria Hatfield Christian Church North, Corner of Willem Cruywagen & Brits Rd, Akasia, Pretoria, South Africa Doors: 6pm Info + Tickets: www.trev-concerts.co.za tel:+27 (0) 12 542 9000 tickets@trev-concerts.co.za, Impact Bookshops; Hatfield Christian Church North"
I hope people in SA enjoy it! I apologise for the lack of content in recent posts. The network I use to connect to the Internet has recently received some upgrades and I have been experiencing connectivity problems. Hopefully this will all improve in the next couple of days.